Born in America but lived in England most of my life. Recently moved to New Hampshire. I love cooking, especially baking and canning. I have a very split cooking personality, sometimes very healthy and sometimes not! What a long break from blogging I’ve had, (did anyone notice, haha)! I often go longer than I mean to between posts although long ago gave up trying to keep up with all the bloggers that post without fail each week (or each day)! However this was a long break even for me. 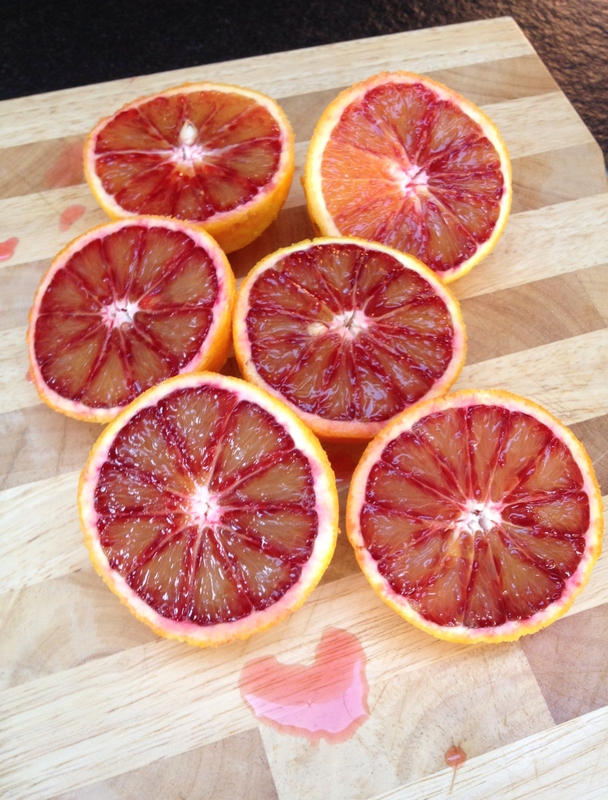 After a fabulous holiday spent in Vermont where I completely forgot about everything and all routine went out of the window I was left wondering if there was a recipe left in me, I had no inspiration at all, until the discovery of this season’s blood oranges put me back on track! I think part of the reason for my lack of inspiration is that I’m caught with that January feeling that I should be eating more healthily but not wanting to, then wondering what’s wrong with me that I have so little control! My head is a busy place this month! Anyone else feel the same or are you all diligently watching what you are eating? Kudos to you if you are! I am pretty much a rule follower but hate been told what to do so I think all the articles and constant talk of diets makes me rebel, after all isn’t January depressing enough? So for those rebels out there I offer you cake in January! 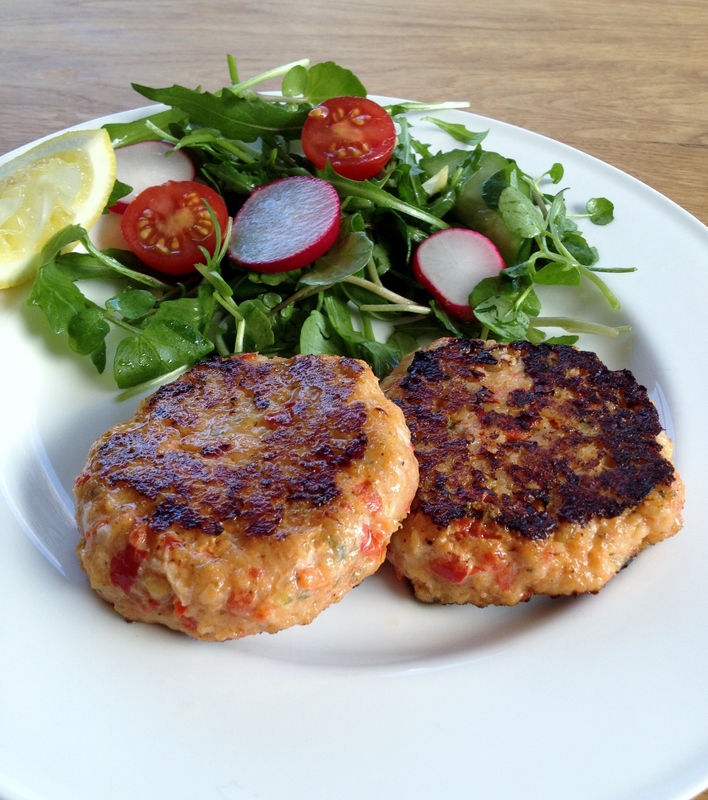 For those avoiding cake, I’m sorry save this recipe and healthy new year recipes will resume! I was so happy to come across the first of the blood oranges but then typically a few sat in the fruit bowl which led me to make this blood orange cake, a simple cake made with olive oil. Using olive oil eliminates the need to soften butter, which in colder climates can take quite a while! 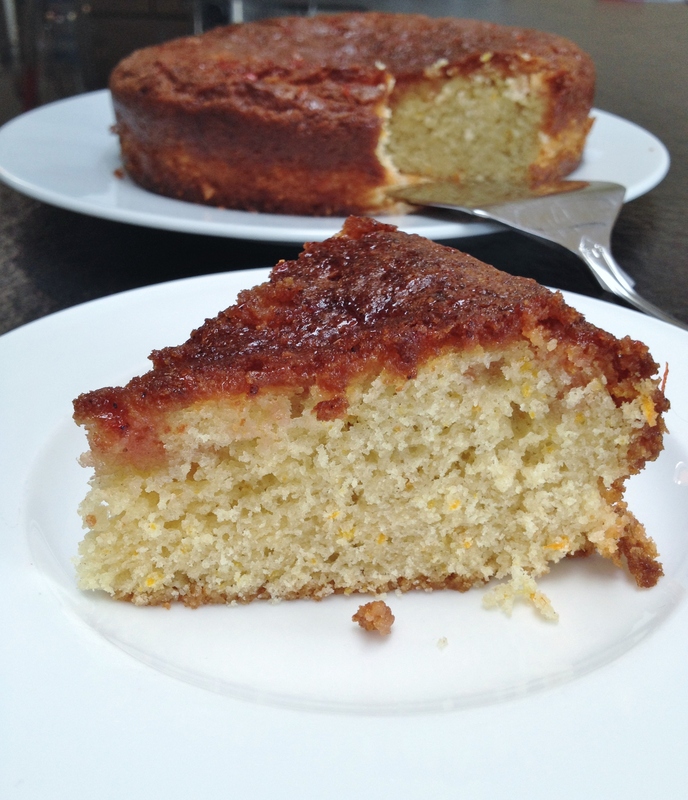 I based my cake on the Lemon Olive Oil cake that I make regularly. That cake is such a success so I thought I would swap blood orange juice for the lemon. I didn’t have yoghurt available so made my own buttermilk by adding a tablespoon of lemon juice to 125 mls of milk. This cake is not fancy, it’s just the right sort of plain with a simple blood orange syrup topping it. I like a slice with a cup of coffee but it would be great served with ice-cream as a dessert! I wont pretend this is healthy in any way but it is good! Grease and base line an 8 inch cake tin (I used a silicone one this time). Preheat oven to 350 F, 180 C, Gas 4. Add the olive oil and blood orange zest. While cake is baking make the syrup by putting the blood orange juice and sugar into a small sauce pan and heat until the sugar has melted, remove from the heat and leave until needed. When the cake is baked, take from the oven and while still hot prick cake surface with a toothpick and pour the blood orange syrup over the cake. Leave to cool in the tin. 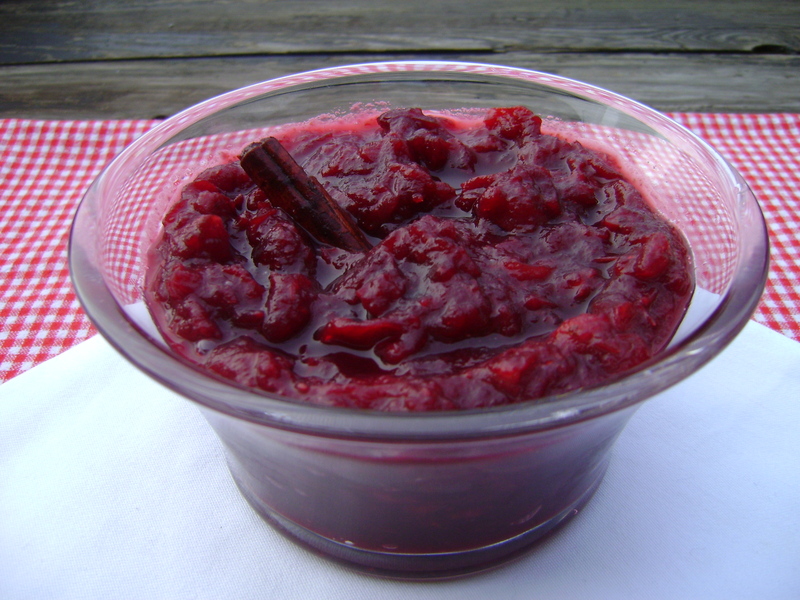 I had lots of ideas to post Christmas recipes this month but December ran away and we went away! 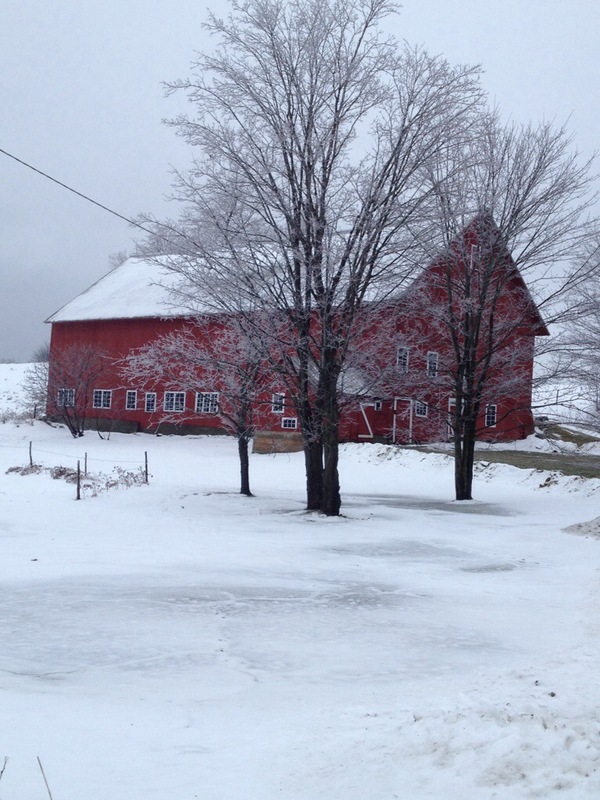 We are in Vermont for Christmas this year and I couldn’t be more delighted! I wanted to say a big thank you to everyone that visits here, especially to those who take the time to comment and like things. I am grateful to you all. Merry Christmas, happy holidays and a very healthy, happy 2014 to everyone. I adore Yotam Ottolenghi, I loved his recent Mediterranean series and I could eat most anything from his book Plenty. 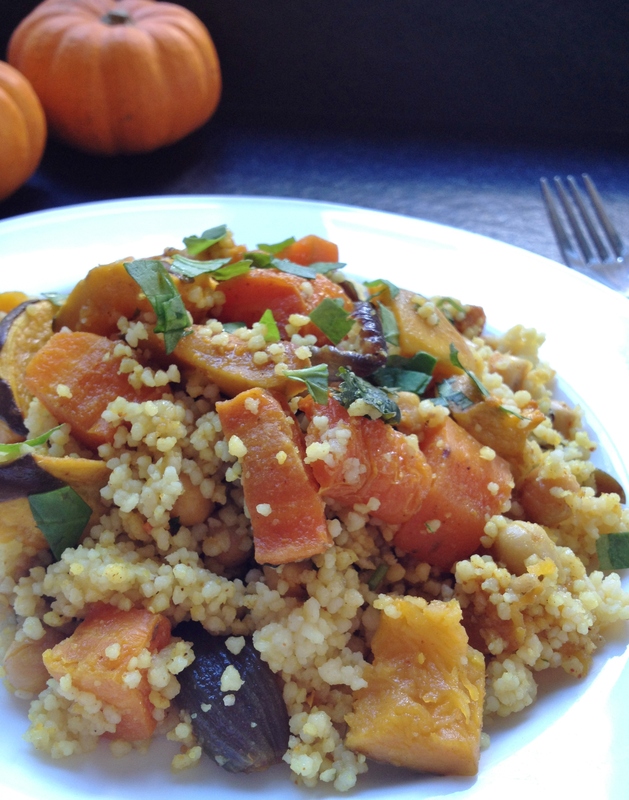 One dish I’ve made from that book several times is the Winter Cous Cous. Although perfect as it is I most often have to change the original recipe to suit my fridge contents! 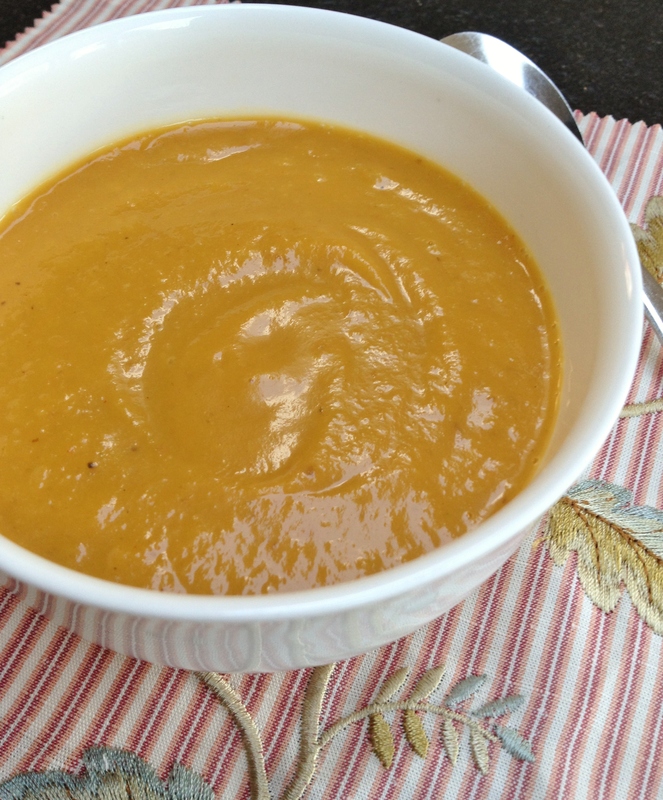 In fact I don’t think I’ve ever had all the ingredients for the original recipe and gradually I’ve changed it to this one which although a little different to the original it is, in my opinion, still delicious. Its full of some of my favourite things. 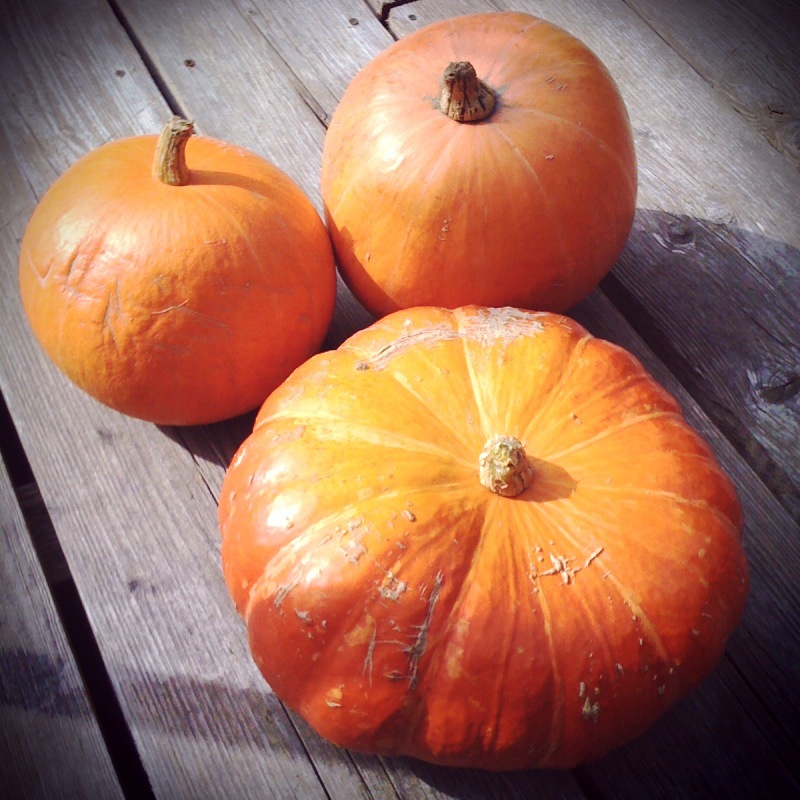 This makes a lovely meal in a bowl, real comfort food, perfect for this time of year. There is enough for 2 people or it’s also delicious cold if you have any left over. Pre heat the oven to 200 C, 400 F, Gas 6. Add the carrot, onion, aubergine, pumpkin, cinnamon stick and star anise and spices (first 9 ingredients) to a large roasting tray. Sprinkle with 2 of the 3 tbsp of olive oil and mix all the ingredients together. Roast for 40 minutes, lessen this time if the vegetables are cooking too quickly in an oven hotter than mine. Add the chickpeas and water to the roasting ingredients and return to the oven for 15 minutes, until the chickpeas have heated through. Now make the cous cous by putting the cous cous into a heat proof bowl with 1/2 tsp salt and the last tbsp of olive oil. Pour over the boiling stock and cover the bowl with a tea towel or cling film and leave for 10 minutes. Dot the butter over the cous cous and fluff it all up with a fork. To serve place some cous cous into a bowl and spoon over the roasted vegetables, remove the cinnamon and star anise first. Sprinkle with the lemon zest and juice and scatter with coriander leaves. Poached pears, that’s not something that usually rolls off of my tongue! Its a dessert that I would usually shun in favour of something more indulgent! However I’ve discovered how wrong I was to assume a poached pear would be an unsatisfactory choice! I had reason to make poached pears recently and I was surprised at how much I liked them! I had the good fortune of coming across a very knowledgeable greengrocer when I went to buy my pears. Not only did he choose perfectly ripe pears for me, he gave me a step by step guide to poaching them, including talking me through making a cartouche from grease proof paper to keep the pears submerged in their poaching liquid (a cartouche is just a circle of grease proof paper). It turns out the greengrocer also has a restaurant and poached pears is one of their regular desserts so it was lucky for me that I chose to get my pears from him! I was surprised that there are a few things in all the recipes I saw that weren’t mentioned so for the beginners out there I thought I would share my poached pear experience here! You will get burnt fingers, beware! Do get a pear or 2 extra just in case of an accident, they are more delicate than you would think. I would recommend you use a spoon to lift the stalk up out of the poaching liquid, grab the stalk then place the spoon under the bottom of the pear. As it’s so hot the tendency would be to lift the pear out of the liquid by the stalk, if you do you risk the stalk breaking off, leaving you with a damaged pear. Let the spoon support the pear’s weight but be careful not to pierce the pear with the spoon, gently does it! For even cooking and colouring the pears need to be under the liquid throughout the cooking. Be prepared to make extra poaching liquid if you have larger pears, the recipe I was using had nowhere near enough liquid, my pears were only half covered so I had to make more in a hurry! The pears should be covered but if you have added more liquid and they still aren’t covered or you don’t want to buy more wine just make sure you turn the pears around often to get even cooking. 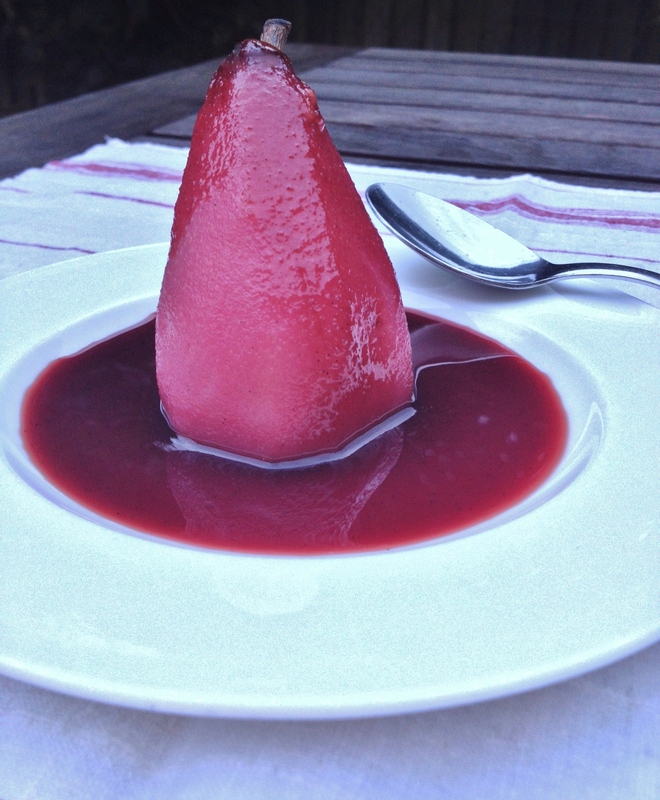 These poached pears make a great dessert for the festive season, their ruby colour is so pretty! The pears make a nice light dessert and would make a nice change from all the heavier holiday foods. The poaching liquid is essentially a mulled wine so the house will be filled with the scent of Christmas as you make these. Add the wine and water to a large pan along with the vanilla pod and seeds, sugar, cinnamon and cloves. Bring to a simmer. Make a circle of grease proof paper to cover your pears while poaching. Lower the pears into the liquid adding more until the pears are covered. Place the cartouche (circle of grease proof paper) over the pears to keep them under the liquid. Simmer for 15-20 minutes until the pears are tender all the way through (test using a cocktail stick). When tender remove the pears carefully from the liquid. When cooled the pears can be stored like this in a Tupperware in the fridge for up to 2 days. Bring the poaching liquid to a boil for around 10 minutes or until its reduced and syrupy. When cooled the syrup can also be stored in the fridge up to 2 days. When ready, serve the pears and syrup at room temperature. Simply place a pear on each plate and drizzle with some of the syrup. Serve with cream or creme fraiche.